My parents took us on long road trips (over 24 hours) twice a year. I don’t know how they did it. My sister and I would push the dog back and forth fighting. The Walkman was a great invention to at least stop the musical arguing. Now, parents can use the natural qualities of geranium to calm their traveling children and their own nerves. I absolutely adore all of these products, and I am especially excited about the car diffuser. They are all of the high quality I come to expect from Aura Cacia. Hotel room make-over mist: add 3 drops geranium, 2 drops lemon and 1 drop tea tree per ounce of water in spray bottle. Shake and spray throughout hotel room. Sun care skin soother: add 3 drops geranium per application of an unscented lotion or aloe vera gel. 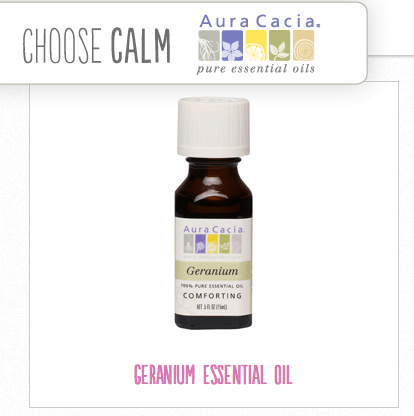 Decompress express for travelers: add 3 drops geranium to 1 tsp. almond oil and massage into temples and back of neck. It would have been nice to have had these products on my trip to Italy earlier this summer. The calming properties of geranium are also great for the home and classroom.